mangymunchkin http://mangymunchkindotcom.wordpress.com I'm a former stay-at-home mom who is back in the workforce and striving to maintain my wholesome approach to mothering and homemaking. I believe that being conscious of my way of living is important not just for my children but also for the planet. In that vein, I strive to combine the best of what age-old wisdom, contemporary culture, and mother nature have to teach about being a responsible parent and denizen, even with limited time and money. Just because I'm busy doesn't mean I need to sacrifice my values and beliefs. In my post on sugar, I mentioned that my girls don’t know the word “dessert” because we don’t eat dessert in our household. While that is absolutely true, it is absolutely NOT true that we don’t enjoy a variety of tantalizing foods that could easily be classified as desserts were it not for their dearth of sugar and depth of nutrients. Frozen banana “ice cream” is one of those foods. Sometimes we eat it as a snack and sometimes it is simply part of lunch, but one thing is always for certain: the bowls are licked clean! It is one of the easiest treats in the world to make: simply peel 2-3 bananas, cut or break them into 1-2 inch pieces, freeze the pieces, and put them in a blender or food processor and puree until smooth (this amount will make about 2 servings). If you have a single-serving processor such as a Magic Bullet, like I do, you may have to puree, then stop and shake the container, then puree, then shake the container, and so on until all of the bananas are blended. It’s a bit annoying, but I prefer it to cleaning out my full-sized blender every time I make the ice cream, which is almost daily. It will take the banana pieces at least 4 hours to freeze, so I generally put them in a container in the freezer the day before I plan to make the ice cream. If you’re not the plan-ahead type, simply cut up several bananas once you’re done reading this post and store them in the freezer so they’ll be ready whenever you want to give it a try! Once you use up those banana pieces, refill the container with more pieces and put it back in the freezer for the next time you get a hankering. My girls and I love to add nut butter to our banana ice cream; we’ve discovered peanut butter and sunflower seed butter to be especially delicious. Adding a tablespoon or two of nut butter to the blender along with the banana pieces adds a bit of fat and protein to make the snack more satiating. Half an avocado, virgin coconut oil, and/or coconut flakes will have the same effect. Other frozen fruits such as blueberries and strawberries taste good, too. If you’re sticking with plain bananas, adding a 1/2 teaspoon of vanilla extract and a touch of heavy cream or whole milk will enhance the flavor. Frozen banana ice cream is an excellent alternative to sugary desserts for those who’d like to transition their children to a lower-sugar diet. The natural sugars in the bananas make it sweet enough to pass as dessert for those used to eating sweets, while the complete lack of processed sugars makes it better for our bodies. Try some of the different flavor combinations above–or invent your own!–until you find one that you and your kiddos like. You will be so thankful to have a food that your kids crave and is actually good for them! It might come as a surprise to you to learn that it is possible to “heal” sleeplessness and tantrums, and as even more of a surprise that it is possible to heal all of the conditions mentioned above simultaneously through dietary changes. But it is! Let me tell you the story of the mangy munchkin’s legs, pictured above at the beginning of summer 2015. She’d been suffering from persistent eczema for several months and had also started developing symptoms of asthma. Non-steroidal creams wouldn’t clear up the eczema so I took her to a pediatrician for advice. The doctor’s suggestion was to try a name-brand cream and then to try an over-the-counter steroidal cream if one of the non-steroidal creams she recommended didn’t help. Knowing about the connection to gut health and overall health, I asked if a change in diet might make a difference but the pediatrician insisted that food was rarely an issue with eczema except in serious cases (I guess she didn’t think Libby’s case was serious). None of the non-steroidal creams she recommended worked. Not wanting to use steroids on the mangy munchkin’s delicate skin, I took her to a naturopathic doctor for alternative advice. The naturopath immediately concurred that food was likely an issue, so she ordered a food sensitivity test that examined antigens in her blood to determine whether certain foods may have been causing an autoimmune reaction in her body, resulting in the eczema. Sure enough, a handful of foods that she ate commonly (including eggs, dairy, coconut, and beans) registered on the test. After eliminating these foods from her diet for a month and applying a bit of Neosporin to the last remaining spot of eczema on her left leg (which had become infected from scratching), her eczema cleared up completely–and along with it, her systems of asthma disappeared. Just one month of eliminating certain foods from her diet healed her eczema, whereas nearly three months of trying various creams did not. While the steroidal cream may have cleared up the eczema (we’ll never know since we never tried it), her rash surely would have returned given that all of the foods she was sensitive to would have still been in her diet had I followed the first pediatrician’s advice. Had I not turned to her diet to heal her, we would have been dealing with bouts of eczema indefinitely, and very likely with a worsening of her asthma. What’s more, her nighttime awakenings and fits as well as her daytime tantrums subsided, something that I didn’t even think to associate with her diet at the time. I only recently realized that her food sensitivity issues were connected to her sleep issues as well when she experienced a resurgence of her eczema this week after she ate handfuls of cashews one afternoon. She’d never had them before so we didn’t realize she was sensitive to them, and along with the rash came several nights of midnight awakenings and several days of crankiness and bad behavior, which is just now subsiding as her rash has disappeared. Dr. David Perlmutter and Dr. Natasha Campbell-McBride both share countless stories of behavior and sleep improvements promulgated by dietary changes in their books on gut health. If you have a toddler who has trouble sleeping and/or throws lots of tantrums (or is depressed), don’t assume it’s the terrible twos or threes–it could be a food sensitivity (or sensitivities, as in the mangy munchkin’s case). Any child or adult, for that matter, who exhibits anxious or moody behavior could be suffering from a damaged gut, which is connected to the brain through the vagus nerve and has been proven by scientific studies to influence not just our digestive tract but also our minds. What if you can’t afford a naturopath or there simply isn’t one in your area? The GAPS diet is an approach developed by Dr. Campbell-McBride that offers a more-or-less surefire way of healing the gut even if you don’t know what your or your child’s food sensitivities are. It requires a drastic alteration in diet, eliminating most foods besides meat, vegetables, and broth for several weeks to several months depending on how serious a person’s symptoms are (and thus how seriously their gut is damaged). If that seems difficult to swallow, think of it this way: meal planning becomes super easy since there’s only so much you can eat! The website linked above provides a wealth of resources for those considering the diet, including recipes. The good news about a natural approach to healing is that once a child is off of the foods to which they are sensitive for a period of time, giving their digestive and immune systems a chance to heal, those foods can be reintroduced and enjoyed once again down the road; how much further down the road depends on how quickly they heal. It only took a month of eliminating the foods to which the mangy munchkin was sensitive before her symptoms cleared up and she was once again able to eat butter, coconut, gluten, and other foods she had previously been sensitive to, only now without any side effects. 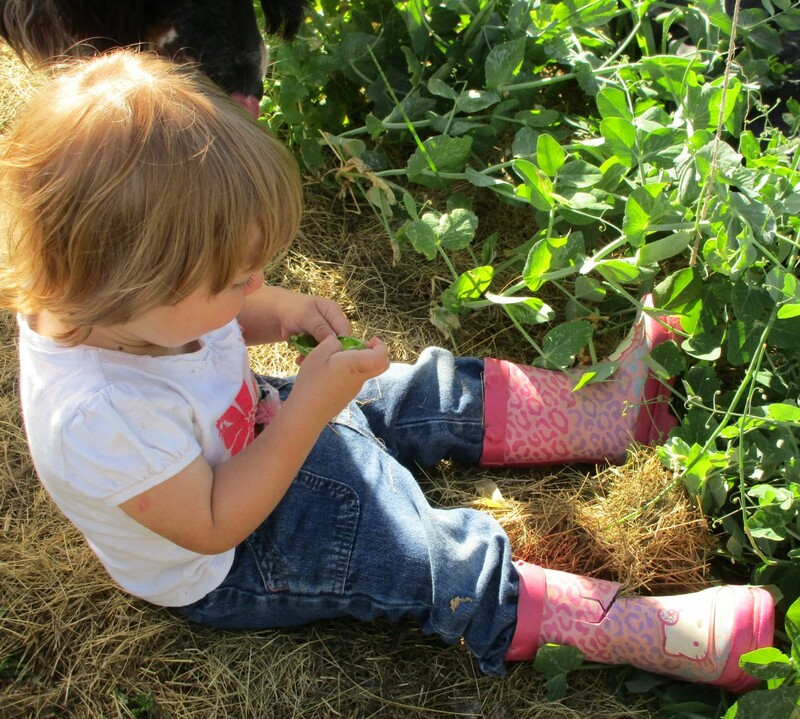 I urge anyone with children—indeed, anyone at all—to take seriously the connection between food and health. Modern medicine and the media would have you believe that the only thing food affects is our weight, but in reality it affects so much more. Anthelme Brillat-Savarin had it right when he coined the phrase “you are what you eat.” If you eat crap, that’s what you’ll feel like. If you eat well, you’ll nourish your body into performing at its absolute best. After my last post on the evils of sugar, I received a request to write a post about what I feed my kids. If we don’t eat breakfast cereals, processed foods, desserts, or drink juice, what do we eat? It might seem that there’s not much left to please children if you cut out everything with sugar and refined carbohydrates, but as you can tell from the photo above, there are still plenty of delicious foods left to keep our little ones happy. 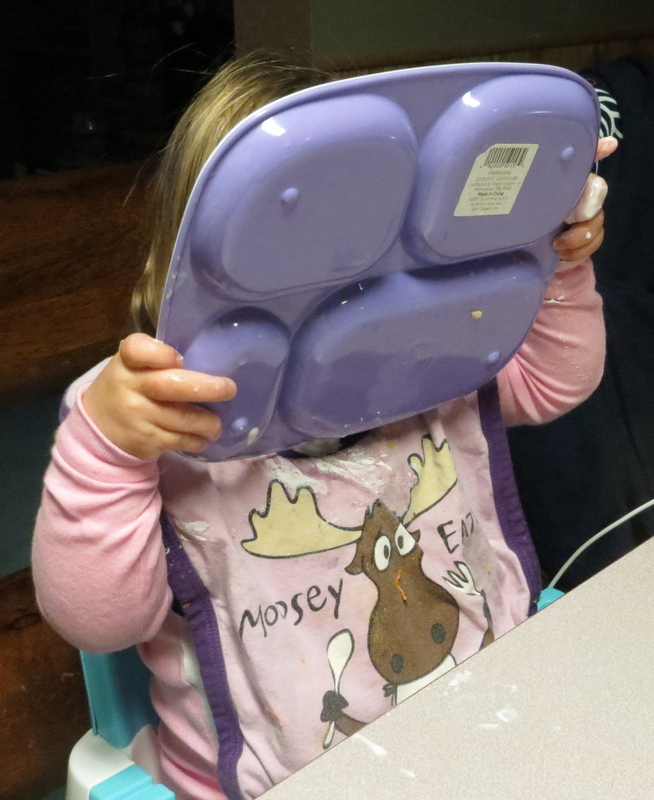 In this post, I’ll give a basic run down of the current menu in our household (it varies from time to time as I discover new foods and recipes) and then share some ideas for snacks to keep your kiddos satisfied in between meals and on the go. If I’ve already posted a recipe that I mention, it’ll be linked to the appropriate post; if I haven’t yet posted a recipe, I’ll try my best to get to it soon so that you can start trying out some of my ideas in your own home! Breakfast is a big deal in our household. It competes with dinner for the largest meal of the day and is always hot except for a side of sauerkraut. Most mornings my youngest and I eat eggs from our free-range hens while the mangy munchkin, who has an egg sensitivity, eats sausage from one of the farms and ranches in our area (for more on why I’m careful about the meat I select, read my post on pastured meat and eggs). All of us eat a side of homemade sauerkraut with our meal to aid with digestion and to provide a healthy dose of probiotics. Occasionally we’ll enjoy a bowl of soaked oatmeal for breakfast instead of (or in addition to) our eggs and sausage. Oatmeal is absolutely delicious with a dash of cinnamon and a tablespoonful of virgin coconut oil, which enhances flavor, satiation, and nutrient absorption. Instead of fruit juice, which has as much sugar as soda, we sip water kefir with our meal. If we don’t eat oatmeal with breakfast, we often eat oatmeal cake for lunch along with chocolate brain pudding and frozen banana ice cream. When I make chocolate brain pudding for my girls, I just use a few squares of chocolate since I don’t want to expose them to too much caffeine. Another common lunch we enjoy is homemade sourdough rolls smothered with butter (we prefer Kerry Gold) and a side of milk kefir, which I make nice and thick so that it has a consistency somewhere between yoghurt and cottage cheese. Believe it or not, my girls LOVE this super tart, probiotic treat and always ask for seconds. Dinner typically involves some sort of meat or poultry and as many veggies as I can muster. If I make slow-cooker chicken I dump in kale, beets, beet greens, broccoli, zucchini, onions, garlic–whatever looks fresh and good at the grocery store (although we usually buy the broccoli frozen). If I brown ground beef, I do it in a large cast-iron pot with a lid so that I can add chopped mushrooms, eggplant, and onions to cook along with the meat for a healthy hash. Baked sweet potatoes or squash mashed with butter and cinnamon are a common side with any dinner, and “dessert” is often one or two pieces of crystalized ginger, which doubles as a digestive aid. If your kids are used to a more sugary, starchy diet, switching them over to the kinds of meals and snacks mentioned in this post might be challenging at first, but it is definitely possible (see my last post for tips on transitioning your children away from refined carbs and sugar). Your reward for sticking it out will be cheerful, healthy children who won’t require a trip to the doctor’s office every month! Oh, and a note about olives: if your kids refuse to eat them at first, show them how to pop them on their fingertips and see if they don’t eat them up once they realize what a fun “finger” food they are! 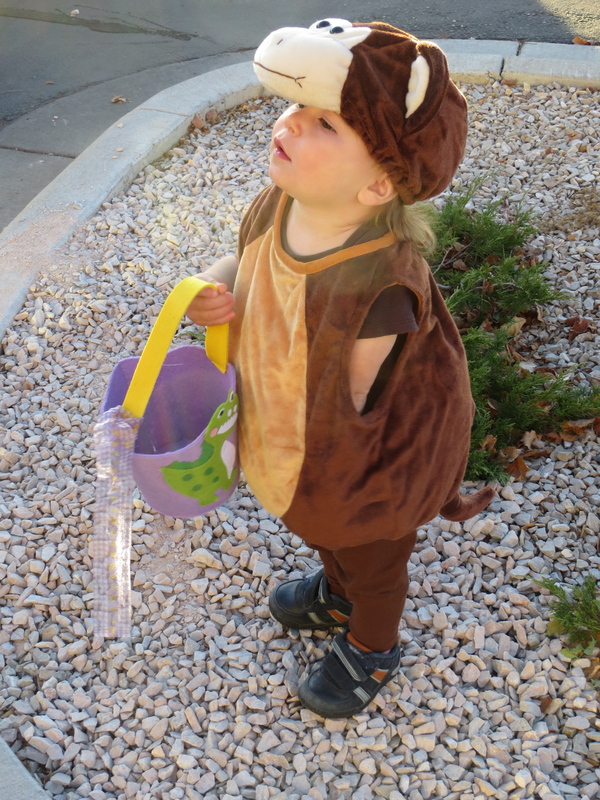 Above is a photo of the mangy munchkin reveling at her first Halloween in costume. Just over 1 1/2, she spent most of the evening in a daze, looking somewhat confused whenever someone placed a treat in her little basket. A year later, when I searched for that same basket to use again this Halloween, I found it in the pantry–still full of the candy I wouldn’t allow her to eat. Every year at this time millions of parents face the dilemma of what to do with bagfuls of candy that we really don’t want our children to eat but that we feel strangely obligated to allow. After all, we don’t want to let it go to waste. And we don’t want to be the mean parents who keep our kids from enjoying Halloween. Or do we? I, for one, have no trouble dumping whole baskets of candy in the trash can (it’s garbage anyway) or saying NO to gorging on sweets on Halloween night. I’ve never been one to bend to peer pressure, and when my children’s health is at stake, my resolve is even stronger. I’m known (probably not very affectionately) as the food nazi in my family, monitoring every bite of food that goes into my girls’ mouths. I’ve even leapt across rooms to defend my children from spoonfuls of sugary sweetness that I don’t want them exposed to, and I can only hope that some day my relatives come to respect my concern over the large amounts of sugar customary in our society. You see, it’s not just a temporary sugar high that impacts our children (or ourselves) when we eat too many sweets. Eating sugar–especially refined sugar–alters our microbiomes in a way that leads to damaging inflammation in our bodies, which in turn makes us susceptible to autoimmune conditions such as autism, ADHD, asthma, eczema, diabetes, heart disease, and even Alzheimers, not to mention everyday illnesses such as the common cold. Having an imbalanced microbiome can even impact our moods, making us more irritable, anxious, and/or depressed. I don’t think it’s a coincidence that when we altered the mangy munchkin’s diet in order to clear up her asthma and eczema, her temper tantrums also abated. Terrible twos? Maybe it’s just too much sugar (and refined carbohydrates in general). So what constitutes “too much” when it comes to sweets? I once read that the human body has not evolved to handle much more sugar than is contained in a single orange–about 35 grams per day (I unfortunately can’t remember where I read this information, but rest assured that I wouldn’t have committed it to memory had I not trusted the source). I was shocked when I first read this because at the time I consumed far more sugar than that even though I ate far less sugar than most of the people around me. I still consume more than 35 grams of sugar on most days, but I try to keep my “overdosing” to a minimum. With time, I’ve slowly whittled away at the primary sources of sugar in our diet. We don’t eat desserts after meals (my girls don’t even know that word) and we snack on more veggies than fruits (although I do allow up to two servings of fruit each day). We don’t eat breakfast cereals, nearly all of which have some amount of added sugar; in fact, we don’t eat processed foods at all since a majority of them contain high-fructose corn syrup–even foods that aren’t generally thought of as sweet such as ketchup. We don’t drink fruit juice but instead sip on water kefir, whole milk, and just plain water. As I’ve eliminated sources of sugar, I’ve found that I’ve simultaneously lost my desire for sweets, making it surprisingly easy for me to resist cakes, cookies, and candies, even when they are the centerpiece at a party. Instead, I crave fats, proteins, and whole grains: lightly salted fried eggs, buttered whole-wheat sourdough bread, oatmeal cut with coconut oil and heavy cream. Yum! I do allow myself a serving of dark chocolate every day, but I don’t consider it candy–it’s brain food. If you think you or your kids could NEVER stop craving sugar, consider this: the microbes in your gut actually send signals to your brain to feed them the kind of foods they crave, so when you start starving the bad bugs (the ones who crave sugar and refined carbs), they will begin to die off and you, too, will stop craving sugar. In fact, “die-off” is a term that refers to the process your body may go through as your microbiome rebalances itself, during which time you may experience headaches, diarrhea (or constipation), or other unpleasant flu-like symptoms as your body expels the unwanted microbes (you can read more about die-off here). This short article by Dr. Raphael Kellmen explains how rapidly our microbiome can adjust to dietary changes–literally overnight! As adults, we can likely muster the fortitude necessary to do what we know is good for us–but what about our kids? How do I get a one-year-old and a two-year-old to eat well? It’s actually surprisingly simple: you say no to the bad stuff (refined sugars and carbs, processed foods, and vegetable oils) and provide them with the good stuff (whole grains, healthy fats and proteins, and plenty of fresh veggies and fruits–just don’t overdo it on the fruit). It may take a few days for your children to accept your “no” and begin to eat the healthier foods you offer them, especially if they’ve become accustomed to a particular diet, but they WILL learn. We had to go through several days of the mangy munchkin barely consuming a bite of food when we transitioned her away from the snacks that daddy had been sharing with her (chips and candy) and back to eating solely healthy foods, but she eventually learned that no means no and if she wanted to satiate her hunger, she’d better eat what was offered. Dr. Natasha Campbell-McBride, in her book Gut and Psychology Syndrome, describes an approach based on Applied Behavior Analysis (ABA) for getting children to change their diets. She suggests presenting a small bite of a child’s favorite food, set off to the side, and only allowing it to be eaten once a bite of a healthier food is eaten first. If the child refuses, allow him or her to do so and don’t try to stop any kicking or screaming. Simply restate your conditions and give the child time to decide that they are willing to eat the healthier food in exchange for a bite of their desired food. The next day, mandate two bites of the healthier food before the desired food is allowed. Continue increasing the number of bites of the healthy food required to obtain a bite of the unhealthy food until the child will contentedly eat a full meal of healthy, nutritious food–and then stop offering the unhealthy food altogether. Persistence is crucial because if you break your resolve just once, you will prolong the battle indefinitely. Your child needs to know that you will not cave when they throw a tantrum or use whatever tactic they are prone to use to get their way. Due to the rapid changes that occur in our microbiome when we alter our diets, it shouldn’t take long for children to begin appreciating and even craving the healthier foods. My girls absolutely love sauerkraut, milk kefir, and real sourdough bread, foods that most people consider far too sour and tart to consume, and I believe it’s because their microbiomes have come to crave these rich sources of probiotics. I suppose some moms might call me mean for not allowing my children to eat sweets devoid of other nutrients (we do eat fruit and coconut puddings sweetened with a tad of honey), but I don’t have a problem saying no when the mangy munchkin asks to have a piece of cake or a cookie at a party, or when the nurse offers her a lollipop after a doctor’s appointment (I bring a small box of raisins instead). I’ll jealously guard the health of my children’s microbiome for as long as I can do so because you become what you eat, and I want my girls to become healthy women whose microbes send them signals to choose nutritious foods. I’ll still allow them to go trick-or-treating tonight, but that bag of candy they come home with will go straight in the garbage–where it belongs.